This is the 20th James Bond film adventure. ShrunkenCinema.com reviews Die Another Day. The James Bonding podcast (Matt Mira, Matt Gourley and guests Ben Blacker and Ben Acker) covers Die Another Day. Jonathan Rosenbaum, Chicago Reader: "The problem for me is that the story is so entirely at the service of the special effects." Time Out: "What makes this the best Bond in years is the surefootedness of Brosnan's performance, as well as Tamahori's fanboy insistence on covering all bases." Richard Roeper, Ebert & Roeper: "I expect more from Bond, so thumbs down." Claudia Puig, USA Today: "The film is so fraught with explosions and chases that the action eventually feels numbing." 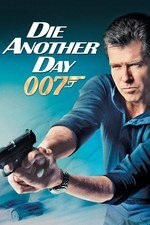 Moira MacDonald, Seattle Times: "Die Another Day never quite finds real excitement or genuine wit." Man, I saw this in the theatres and the most I remember about it is Halle Berry and the Madonna theme song, which we listened to a lot that semester of college, for some reason. This movie is forgettable despite having a hovercraft chase. That's really something. This is where the Brosnan era falls completely into the Bond cliche of excessive self-reference (e.g. Jinx's swimsuit) and general over-the-top-ness. That's what sunk Moore. When your movie compels a reboot, you know you've done something wrong. Pre-Gone Girl Rosamund Pike, though! She's swell. Yeah, this movie is Not Very Good. It is tonally all over the place and really just needs to commit to either being a serious espionage thriller or a big dumb action movie instead of hanging in the awkward limbo in between. I definitely think Toby Stephens as Gustav Graves deserved a better, goofier, dumber movie. He was delightfully over-the-top. An invisible car has to be one of the stupidest inventions to ever trouble the franchise. Not because it's implausible, although it of course is, but that it's utterly impractical! You couldn't drive it on any road populated by any other people while invisible, and in fact you couldn't even park up invisible without fear that someone would crash into you. It's only use would be for off roading invisibly, but then it's not even an off road car! This is the one that I always think of as the Fanservice Bond. No, not that kind of fanservice -- Die Another Day was the 20th Albert R. Broccoli/Eon Productions release and the 40th anniversary of the franchise, so they made a point of throwing in references, winking nod style, to all the previous films, and even features a scene with the book A Field Guide to the Birds of the West Indies, the author of which being Ian Flemming's inspiration for the character name. What plot is here is merely a framework for them to hang a bunch of recycled Bond Movie tropes off of in the filmmakers' attempt to say "Those movies you love? They're our favorites too." Fitting that it became the last one before the reboot. An invisible car has to be one of the stupidest inventions to ever trouble the franchise. Not because it's implausible, although it of course is, but that it's utterly impractical!...and in fact you couldn't even park up invisible without fear that someone would crash into you. The invisible car is what cemented my belief, in the theater, that this was a badly-written Bond movie. Here's the end of the chase sequence. It seems clear that had Bond simply backed up without first turning his car invisible, the trick would still have worked. It's Bond's quick reflexes (and his car's extra-traction tires) that make the difference. The car's invisibility is worse than impractical: it's superfluous. This is actually a perfectly good Bond film - maybe even an excellent one - up to a point. I mean a literal point in time. And I will tell you exactly where that point is. It's when Halle Berry jumps off the wall of that old Spanish fort in Cuba into the sea. Up to then, the whole thing about Bond actually getting caught by the bad guys and thrown in prison, and then the suspicion of him and why he was swapped back - did he break? what did he tell them? can we still trust him? - and his escape and one-man jaunt through Hong Kong and his pursuit of the people who have essentially burned him? That's all really good stuff. It's coincidental that it all goes to hell right after Halle Berry jumps off a wall, but the movie goes right down with here and just goes splat and leaves a messy pile of silly junk all over the screen. I do have a couple nice things to say about it - I've been crushing on Rosamund Pike ever since this movie. But also, a friend and I went to see this when it came out and discovered the showing we had come for was sold out. So we looked around to see if there was anything else we could agree on and that's how I saw The Ring, which I might not have seen otherwise, and which was a damn good creepy little horror movie. So there's that. Naberius, I agree completely. The beginning of the film is really great and I was excited! Then it just becomes a "this CG will be really embarrassing in ten years" fest. I read or heard an analysis of the Brosnan films a while ago that I mostly agree with...It suggested that all of his 4 at least start off with great potential, but then they each go off the rails to varying degrees before they end. I agree that this goes rotten when Jinx dives off the wall...It's a cheap-looking effect to depict a doable stunt, in a series known for having great actual stunts. From that point you know you're not in the hands of people interested in actually honoring the series' legacy, but in catering directly to a generation that might not have ever seen a movie made earlier than the 90s. But we should be thanking this movie for how dumb it is...Just like you don't get a Batman Begins without a Batman & Robin, without a Die Another Day you don't get a Casino Royale. Batman & Robin is a great movie, doctornecessiter, and saying otherwise isn't very ice. No, but, yeah, I totally agree that the Jinx CGI stunt is where this film went off the rails. That should be an actual movie term. Though "CGI'd diving off the edge of a fortress used for implausible genetic modifications" doesn't have the same catchiness as "jumping the shark." I guess you could say that that scene....jinxed the movie! I also think this film starts out really well. I think it's when the invisible car arrives is the point where the film goes off the rails, but the first half of the film feels very Fleming-esque, particularly the capture, the torture and the attempt on M's life - which basically comes from the novel of The Man with the Golden Gun. I think Brosnan's only good Bond film is Goldeneye. Die Another Day is curious because the first half is definitely better than any of the Brosnan films, but the second half is worse than some of Roger Moore's dreck. Rosamund Pike was basically a Bond good girl in Johnny English Reborn, which is a better film than this in nearly every way. But I bet she had a lot more fun playing the Bond bad girl. They drop the "point" pun about blades/foils three goddamn times in this movie. One time would have been too many. I think it got added in all those times with the intention of picking the "best" one and then removing the others, but then they just forgot and left them all in. Did I miss the post for The World Is Not Enough? The World Is Not Enough was posted previously as part of the "Spirit of 1999" club. So I guess it didn't really end up discussed as part of the Bond club, though it really should have been. I wonder if the mods have a way to get a post to reappear on the fanfare page. Or if a movie can be posted more than once, since that post has a specific "Spirit of 1999" club format. You can just add the Bond club tag which is already there, I think. It won't bring it up to the top but you can make a Fanfare Talk post that can point people to the discussion there. This was the worst Bond movie hands down. All the CGI stuff - Bond surfing on a goddamn tsunami - this movie just phoned it in. Awful.